As a savvy vacationer, you already know the advantages that vacation rentals have over hotels — access to a kitchen, more space and bedrooms, etc. But when it comes to booking the vacation rental itself, there are still decisions to be made. In a single search, you will probably see results from Airbnb, VRBO, FlipKey, and a handful of local property management companies. Here's why you should be your vacation rental direct (from a local property manager) instead of from an online travel agency (OTA) like Airbnb or VRBO. The fees stack up when you book through an online travel agency. In fact, you could pay over 10% more for the same property when you book through an OTA compared to when you book directly. And, local property management companies can offer booking specials that aren't available through OTAs. Typical specials offered throughout the year include free nights, reduced minimum stays, or percentage discounts. 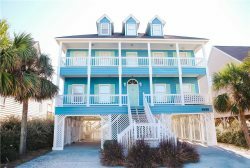 Just take a look at our North Myrtle Beach rental specials as an example! Vacation rentals that are professionally managed are clean and well maintained. You won't feel like you're staying at a friend's house, like people often experience with OTA bookings. If you do experience a maintenance issue, it will be solved more efficiently when you book directly. The property management company can quickly send the maintence team to resolve the issue. If you did not book directly, the OTA would have to contact the property manager or owner, who would then have to call maintenance. This is a much less streamlined process. Local management companies often have relationships with other area businesses and can offer discounts. This can be a huge benefit if you're planning on enjoying local attractions and entertainment. All guests of Ocean Drive Beach Rentals can enjoy our Endless Fun Club, which includes discounted tickets for activities and great savings at restaurants. If you have any questions on our rentals or need recommendations on travel or things to do, contact our local team! We love to help start new traditions on the Grand Strand.